September’s AYC Monthly Meeting features the new Commodore for the C22 National Association, Don Boyko, from San Marcos, CA. Don is working to build C22 action in the West. The meeting is Tuesday, September 10, beginning at 7pm (but arrive early for dinner). Monthly meetings are held at the Caddy Shack @ Rolling Hills Golf Course, 1415 North Mill Avenue, Tempe, AZ 85281-1205 (map) and both members and non-members are welcome to attend. Also, we’re planning a “pre-meeting” on cruising and chartering, beginning at 6pm. Come on by! One of the big western events for Catalina 22s is Don’s 5th annual “Post Thanksgiving Day Weekend” at Mission Bay Yacht Club in San Diego. It includes free vehicle and trailer parking, free launching, free dockage for the weekend, free use of the MBYC facilities, and the galley will be open for breakfast, lunch, and dinner during the entire weekend. He’s also planning a 2014 West Coast Cruise next July, starting at Mission Bay Yacht Club. They’ll spend a couple days in Mission Bay, then sail around Pt. Loma and into San Diego Bay for the rest of the week. Home port in the south bay will be at the Chula Vista Marina, which offers great facilities, with a restaurant and bar located right at the marina and the best sailboat ramp on San Diego Bay. Don and his wife have been very active in the San Diego area, organizing various events, including that Thanksgiving weekend cruise. He’s also written often for the Catalina 22 Main Brace publication and is active on Internet forums—enough so that he was asked to take the Commodore slot. Don wrote an interesting bio for us that you can read here. 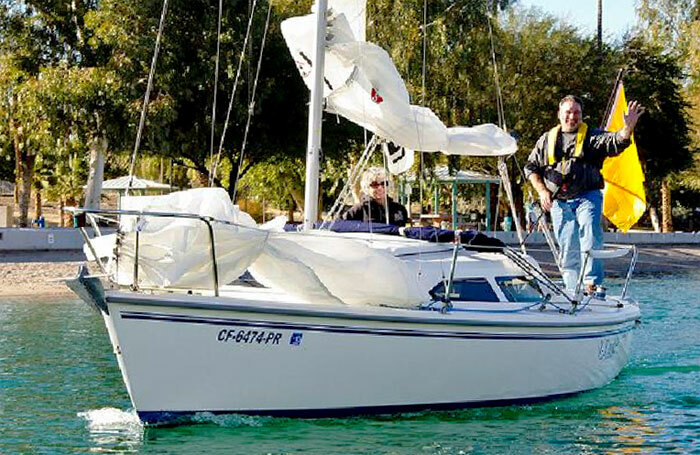 Want to Learn to Charter and Sail to Catalina?